UPDATED | After months of speculation about Adelaide landing a big fish in the so-called ‘superdraft’, in the event it was the players they didn’t select that stole the show. Adelaide’s longer-term fortunes are now inextricably linked to how badly wooden-spooners Carlton perform next season, after the Crows sensationally pulled off a pair of trades – last night and late this morning, SA time – that will see them snare both the Blues’ first and second-round draft picks in 2019. After Gold Coast today swooped to secure South Australian Jez McLennan at the start of the second round, Adelaide opted to trade down the draft order, in return picking up a future second round pick from GWS that will come via Carlton. Our incoming future is Carlton's 2019 second-round pick, which the Giants received in a trade for Will Setterfield. The Crows then added to their draft stocks with versatile Dandenong Stingrays defender Will Hamill at pick 30. A further pick swap with Carlton later down the order saw the Crows offload a fifth-round 2019 selection to move up the draft three places, from 67 to 64, in order to snare running midfielder Lachlan Sholl – son of former Carlton winger Brett Sholl. Today’s moves followed a much-hyped first-round of the draft in Melbourne last night. The Crows and Port Adelaide, as expected, missed out on SANFL wunderkinds Jack Lukosius and Izak Rankine, both snapped up by Gold Coast with picks two and three at Marvel Stadium last night. Instead, Adelaide snapped up Tasmanian midfielder Chayce Jones with pick 9 and tackle-happy Geelong Falcons small forward Ned McHenry at 16, while Port snared young North Adelaide gun Connor Rozee with its prized Number 5 pick, and a pair of Victorian midfielders, Zak Butters and Xavier Duursma, at 12 and 18. But it was a late blockbuster trade that saw Adelaide relinquish its third first-round pick that turned heads on the first draft night to see the introduction of live trading. Industry insiders and fans alike are still trying to figure out who ‘won’ the blockbuster deal with wooden-spooners Carlton, who shipped next year’s first-round pick to the Crows for last night’s pick No.19 and delaide’s own 2019 first round selection. Blues list boss Stephen Silvagni pulled the trigger on the risky trade to take Sandringham Dragons midfielder Liam Stocker. But it’s a high-risk gambit for both clubs – if Carlton struggle again next year and Adelaide bounce back into the finals, the deal will be a steal for the Crows. The SA club could conceivably win the flag and have the No.1 pick at the 2019 draft if the Blues take the wooden spoon again. “That’s all speculation – what happens if we finish on top of the Crows? It is what it is,” Silvagni said. “The season will take care of itself and what we do know is we’re really happy to bring a good player through the door. “This is going to happen more and more – if you travel to the US, this happens a lot. It came, ironically, after widespread speculation that Adelaide would trade up to try to snare one of Lukosius or Rankine – a bid that evidently fell on deaf ears with Gold Coast. “There’s always a bit of risk but with that also comes reward,” Reid said of the pick swap. “I guess you can’t (judge it) until you get to 12 months time and we know what positions we sit in in the draft. 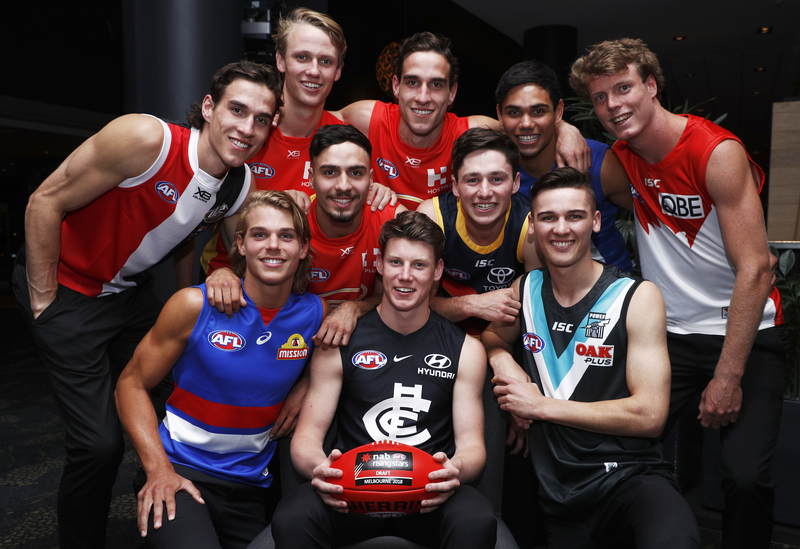 In all, 22 players were taken in the first instalment of AFL’s new format, with the remaining rounds of the national draft and the rookie draft continuing today. West Coast will kick off proceedings at pick No.23 before Adelaide’s next selection at 24. The Blues had already, expectedly, claimed Geelong Falcons star Sam Walsh with the No.1 pick. The Power are celebrating their draft hand, with national recruiting manager Geoff Parker insisting Rozee was drafted on ability rather than geography. “We made it clear that we didn’t move up the draft order just to secure a local South Australian, but that a player of Connor’s class was still available at pick 5 made it a very easy decision for us,” he said in a statement. Western Jets 18-year-old Butters, who spent a chunk of the preceding season recovering from shoulder surgery, insisted ahead of the draft that “I can do full contact and full training, so I will be ready to go, day one”. “It’s good to show that you’re in good shape and you’re back fit,” he said. Live trading also brought controversy, with Sydney swapping draft picks with West Coast twice – either side of drafting highly-rated academy player Nick Blakey. In a complicated AFL version of tax avoidance, the Swans effectively reduced the price they had to pay to recruit their highly-rated academy player. The AFL approved the complicated two-part plan – meaning it was avoidance, which is legal, not evasion, which is illegal. Sydney started round one of the draft with two certainties – that they were very keen to secure Blakey, the son of two-time North Melbourne premiership player and long-time Swans assistant coach John Blakey. And, because Blakey is from Sydney’s player academy and is highly-rated, they would have to match a bid from a rival club to draft him. What no-one could have foreseen was how they would lessen the cost of matching that rival bid. The ploy started just before pick seven, when Sydney became the first club to use the AFL’s new live trading of draft picks. In a move which had onlookers scratching their heads and wondering “why?”, the Swans traded pick 26 to West Coast in exchange for a future third-round pick. At round 10, GWS duly made a bid for Blakey and the Swans matched it, meaning Sydney had their player. Then, the Swans did another live trade with the Eagles, who gave up pick 22 in exchange for a future second-round pick. The genius of the ploy was two-fold – first, the Swans had reduced the draft “tax” they had to pay for Blakey, because they didn’t have pick 26 at the time they matched the GWS bid for him. Instead, they gave up picks 34, 39 and 40 to thwart the Giants. Then, after the second trade with West Coast, they also improved four spots in the second-round draft order. And best of all, it had the AFL’s approval.